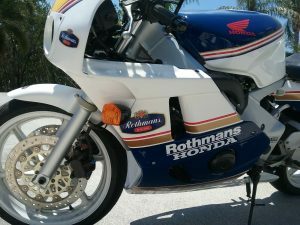 Most often Rothmans livery is seen on two-stroke race replicas, but this middleweight is a 399cc inline four. 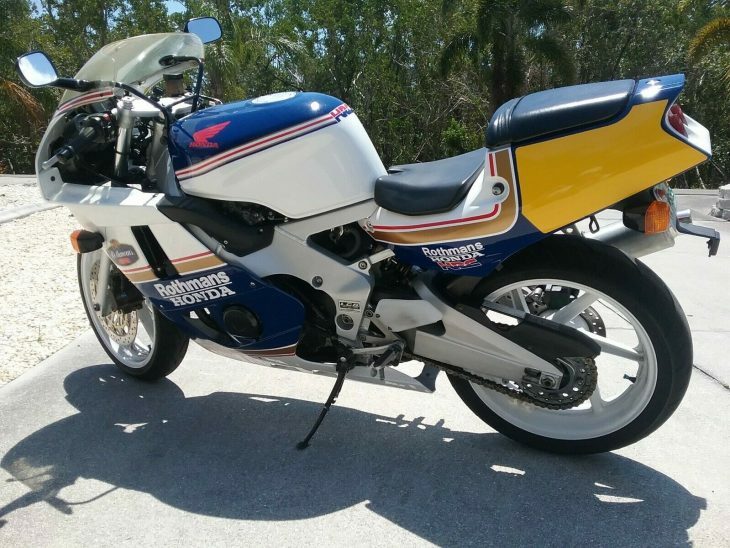 It's a grey market import from Japan, registered in Florida and looking excellent with just under 7,000 miles. 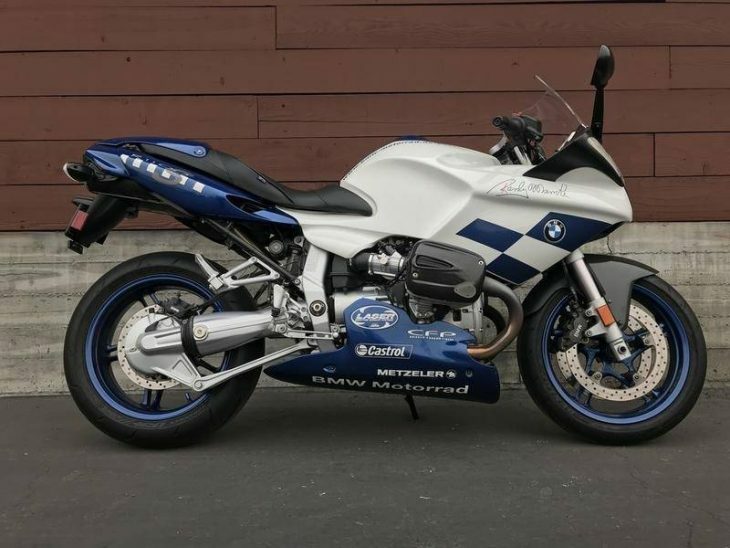 Sometimes referred to as the "baby 'Blade", the CBR400RR was developed several years earlier, but restyled in 1992 to accompany the Fireblade to the showroom. 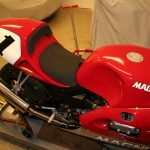 It was also built like a larger bike, alloy twin spars of the chassis and swingarm ready for much more than the factory 59 hp. Faired scoops deliver fresh air to the engine, by way of four 26mm flat slide carbs. 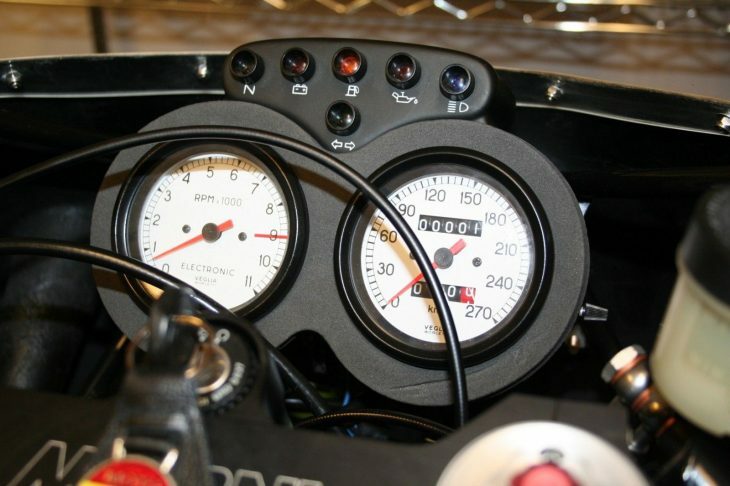 Showa suspension all around, preload-only adjustable, leaving room for enhancements. Grown-up dual discs are 276mm, and dry weight is just 360 lbs. 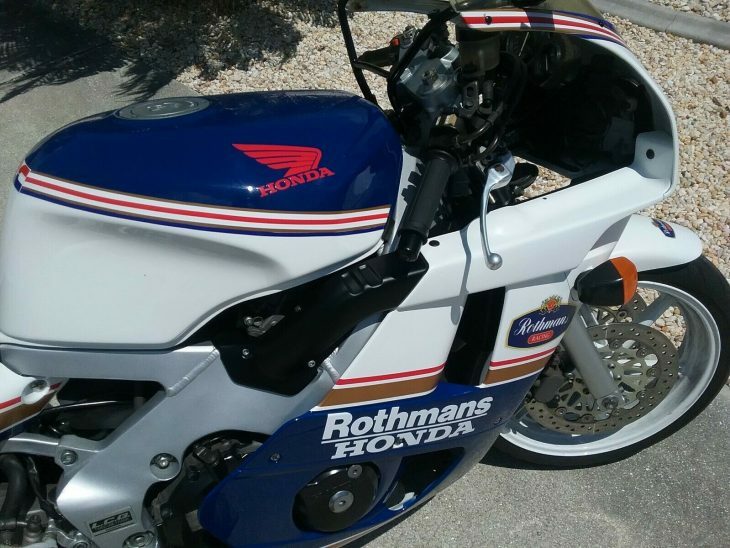 Beautiful NC29 1992 CBR400RR in Rothmans paint. 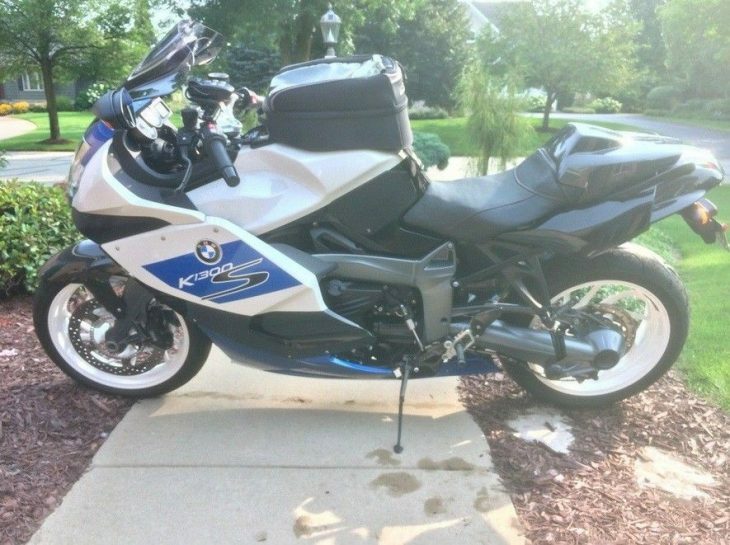 Low miles, runs great, very clean, new battery and chain. Florida title ready to go. Direct Japanese grey market import. 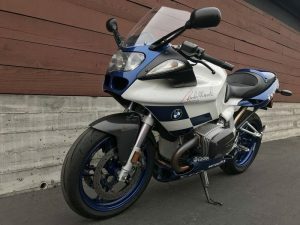 Designer Masanori Aoki was a youngish pro when he led the CBR400RR effort, staying with Honda through the 1800cc Gold Wing, and more recently the Rune factory-custom. 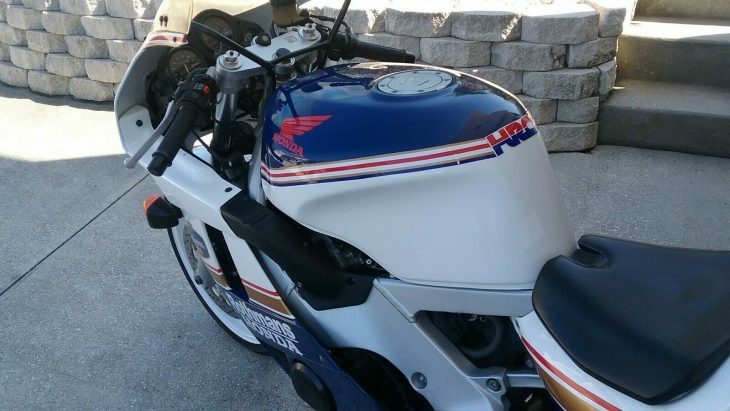 Designed as junior machine for learning riders, the CBR gained a great following in the sporty grey market. Though committee-designed and conforming to Honda's value-engineering principles, it's still a high-revving, lightweight, and beautiful package. 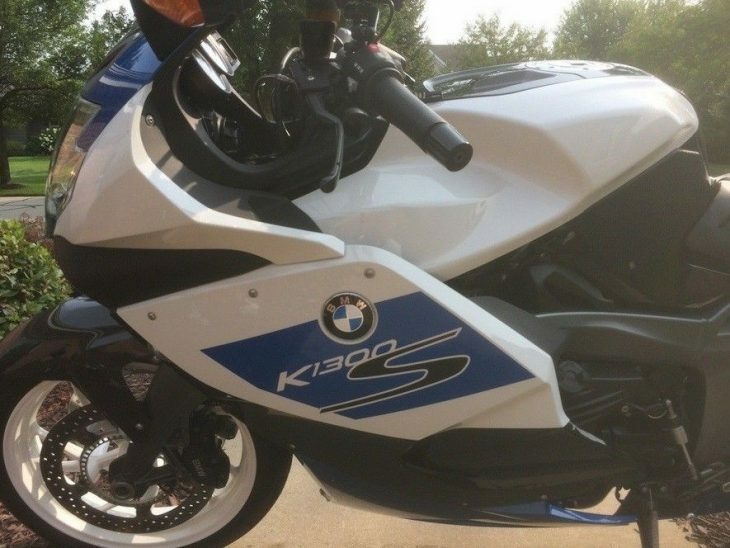 Even if you're an Italian bike fan, this one might have flown under your radar. 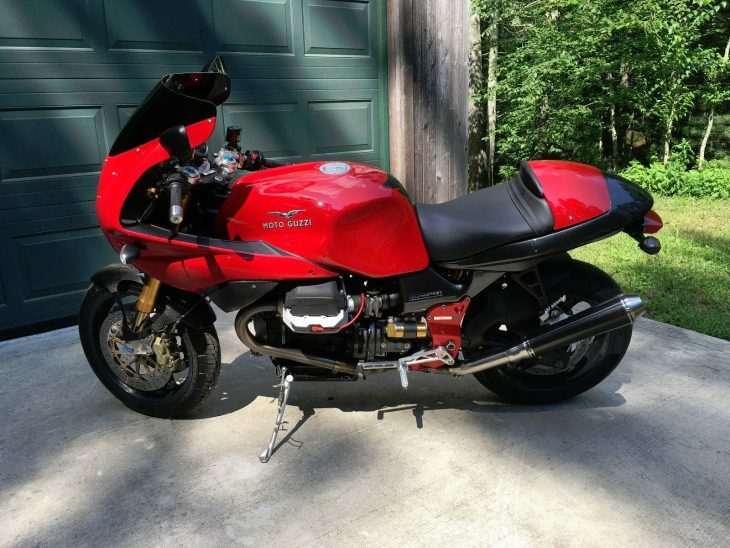 But that's what we do here at RareSportbikesforSale.com: let you know that interesting bikes like the Moto Guzzi V65 Lario exist. 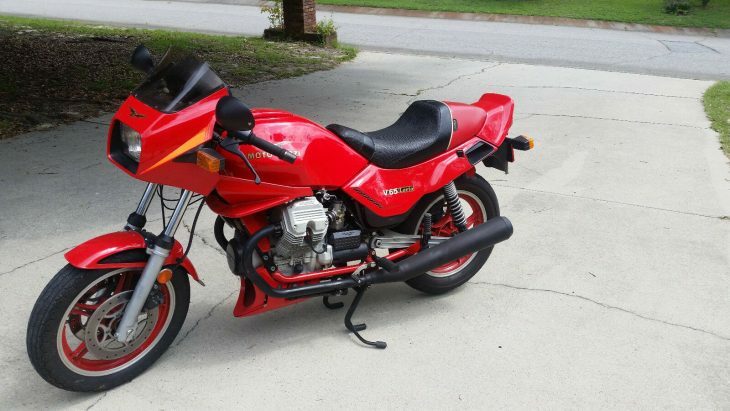 I especially love 80s Moto Guzzis because they're generally pretty durable and very affordable. 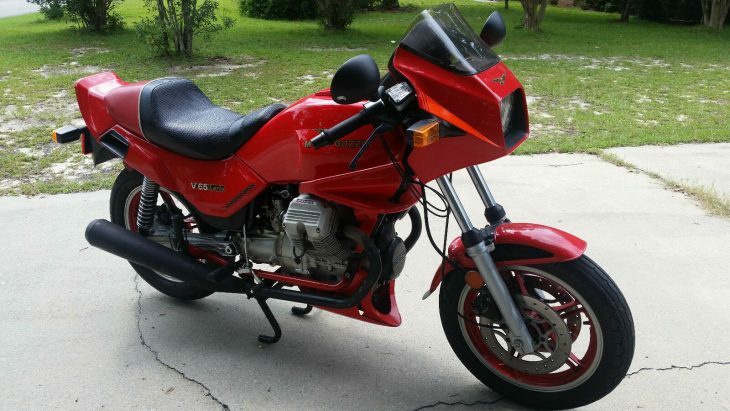 They won't set the world on fire with their performance, but they're quirky, stylish, and pretty good handlers, if you allow for the fact that it's a 32 year old motorcycle on 16" wheels. 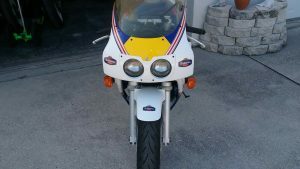 The bike could work up a decent turn of speed, with 60hp and a five-speed gearbox that meant the bike could do an honest 110+ with good handling for the time. 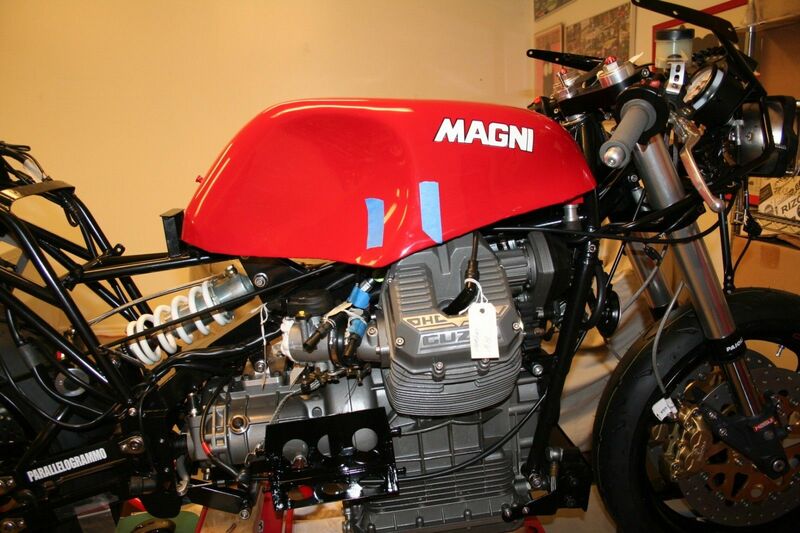 Oddly, Moto Guzzi's 643cc "middleweight" was a more mechanically sophisticated machine than their big Le Mans. It was still air-cooled, but had four-valve Heron-style heads, with the four valves operated by pushrods and rockers, similar to the setup used in the later four-valve Daytona. 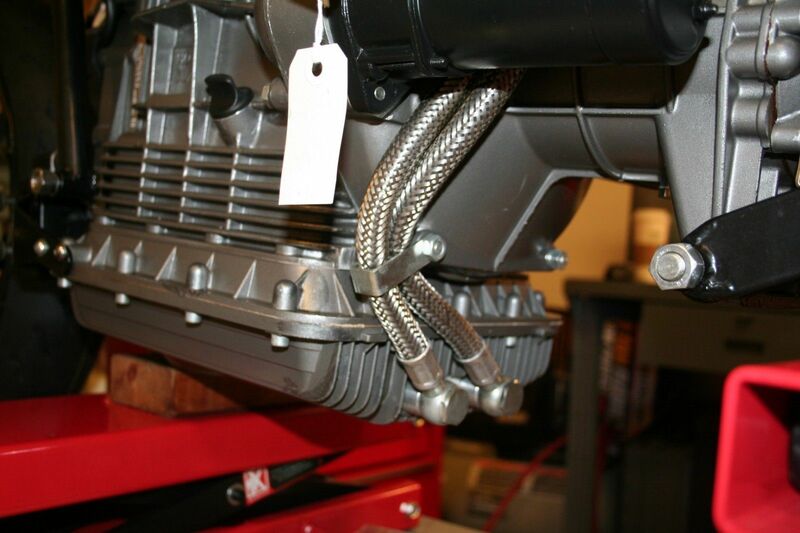 Heron heads, if you're not familiar, have flat surfaces instead of domed or hemispheric combustion chambers, with recesses cut for valves and spark plugs. Instead, Heron-head engines generally use dished-top pistons to allow room for the fuel/air charge. This means the heads are easier to produce, and Heron heads have been used in a number of automotive applications, including Jaguar's V12. Unfortunately, the 4-valve "small block" Guzzis have a reputation for catastrophic failures. 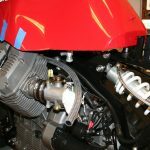 Digging around the Guzzi forums, the problem likely stemmed [ahem] from the two-piece valves that tended to fracture, although the cam and valve springs have also been blamed. Who knows? 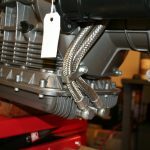 You might get lucky and the bike will be fine, or a combination of softer valve springs, a set of Suzuki 250N valves, and careful use might see you through, but… caveat emptor. Hopefully by now that's either been an issue and rectified, or never will be a problem, but I do get a bit nervous when I see a low-mileage example come up for sale. Easy to check though, with those cylinder heads sticking out proud of the bodywork like that, and the owner may be aware of them being checked recently or repaired. 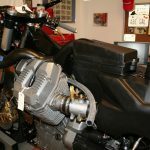 Bottom line: if you buy one, try out the updated valves and springs recommended by the Guzzi message boards and ride it with your fingers crossed until it breaks, then see about finding a two-valve engine from a different model. 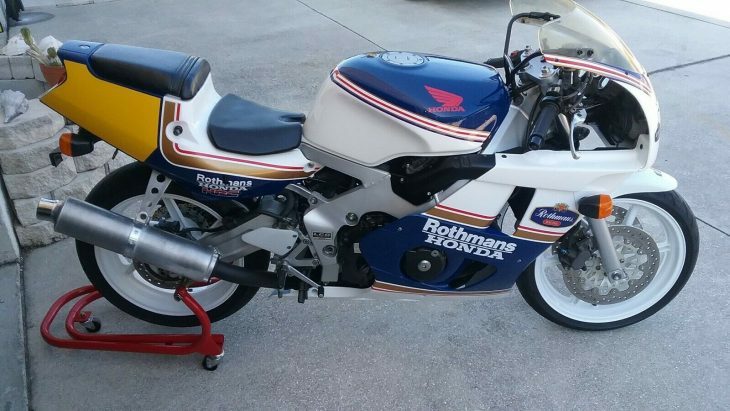 I believe the 750cc Nevada engine is a popular choice for this, if you can find one. 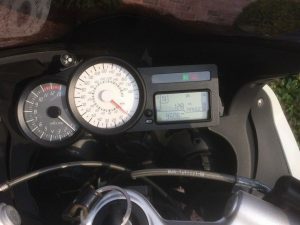 I love the huge, white-faced Veglia tachometer on a bike that probably doesn't even need a tach, the padded "safety" dash, and the button key. If you've never seen an original Guzzi key from the era, the fob basically folds over once the key is in place, forming a sort of knob you turn to switch on the ignition [see above]. Bodywork is swoopy and very 80s, but will provoke questions wherever you go. 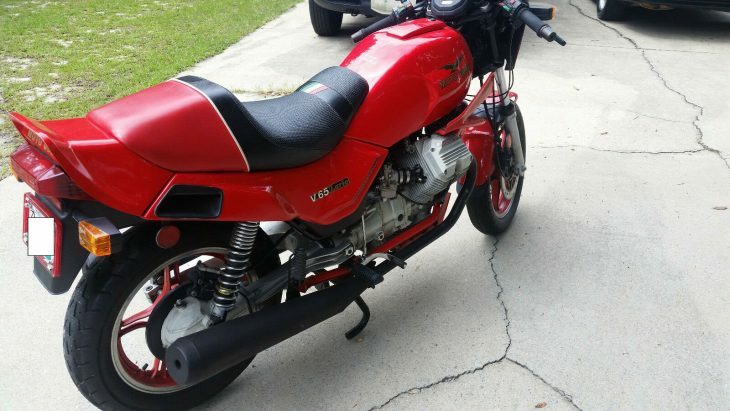 First and most common: "Moto Guzzi? Who makes that?" 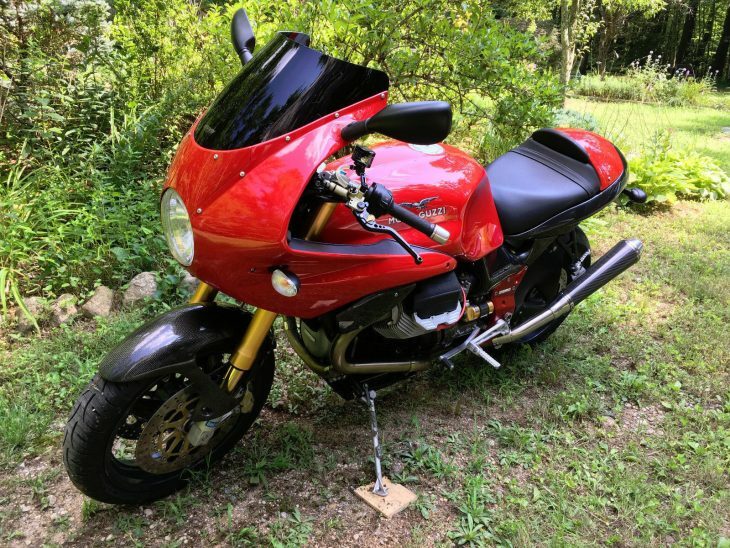 This isn't pristine, but is in very nice condition and should make a great, quirky weekend ride if you want something interesting and don't have a ton of cash to splash. If you're looking for a budget classic, the V35 and V50 are obviously not as fast, but sweet-handling and much more reliable. 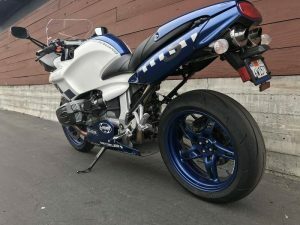 All-in-all, it's a funky little bike, but there are reasons they don't go for very much and have low miles. If you like to tinker, it might be worth a shot. 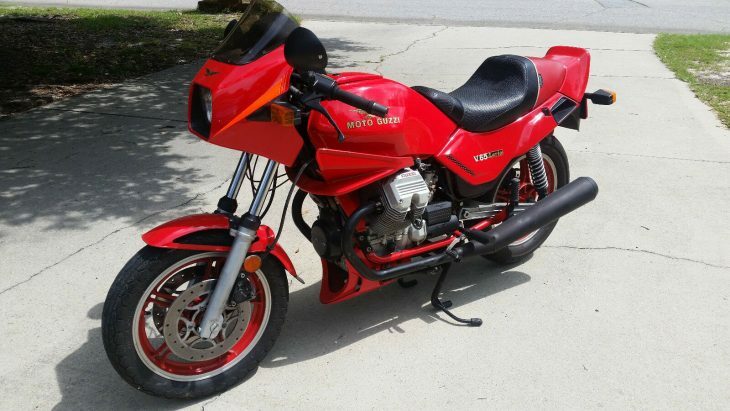 I bought this bike in 1993 and I am the second owner. 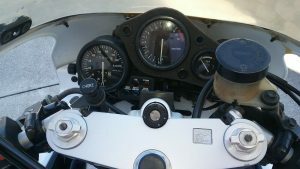 Very low miles always starts up no problem, idle is a little rough when cold but fine when warmed up, carb balance is difficult to maintain on these even with the right tools. 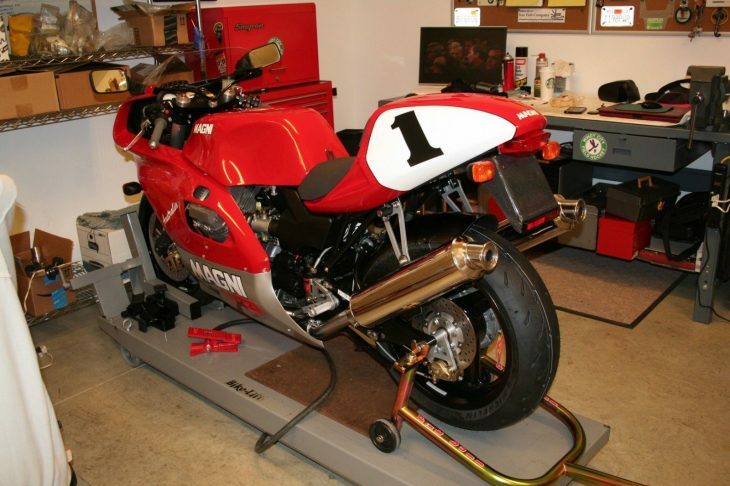 Previous owner had megaphones on it and said he had changed jets to suit, I put the original exhausts back on and messed with jets but couldn’t find any better set up than what it has now, it runs great accelerates very well and it is pretty fast for an old 650. 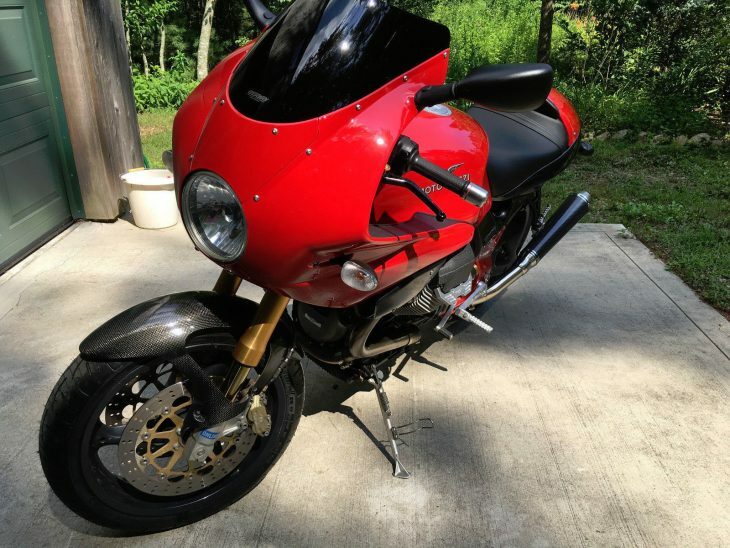 The only issues I have had are leaking fuel lines and carb/intake connections, all of which have been replaced. There are a few cosmetic issues that I tried to show in the photos, mainly with cheap plastic and paint. The fairing has a crack across it which has been repaired with a fiberglass patch across the back leaving a small step, this could be buffed and painted but the crack is only visible from the underside. 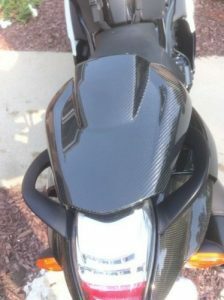 The belly fairing also has a stress crack down the front; nothing has been done to it. 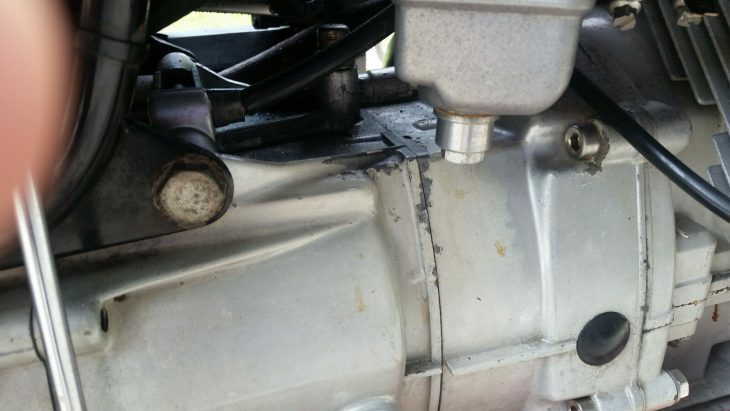 Some of the engine paint is peeling under the carbs due to the fuel leaks and on the bevel gear housing; the front forks have a few scratches due to tag stickers and their removal. Some of the red wheel paint is flaking but this is an easy fix. The air cleaner box has been removed and K&N filters installed and the seat replaced with a Corbin single. 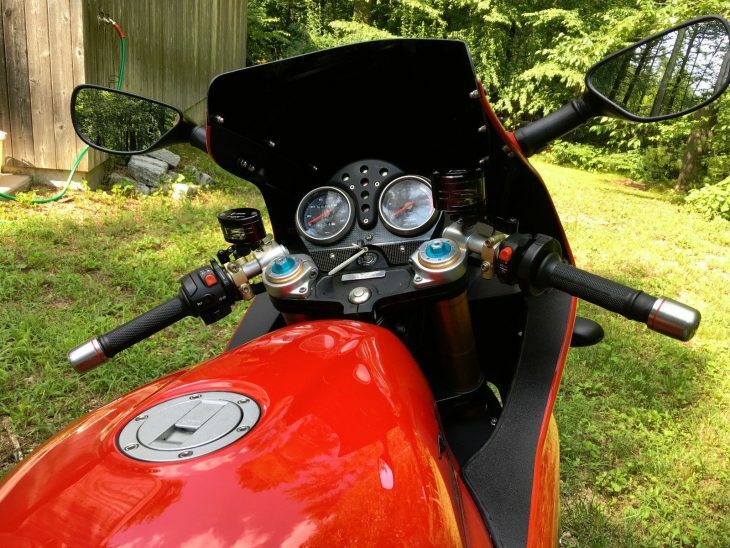 The only other mod was to replace the remote choke lever assembly with individual carb mounted levers. I have the remote assembly. 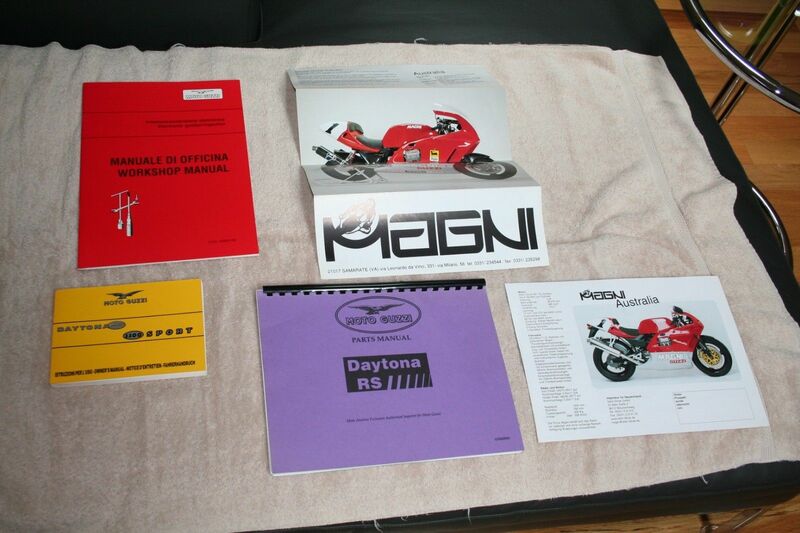 It has the original tool kit, a few spares, including the megaphones, at least two keys and a clear title. I can deliver to a shipping point within 50 miles of Columbia SC. 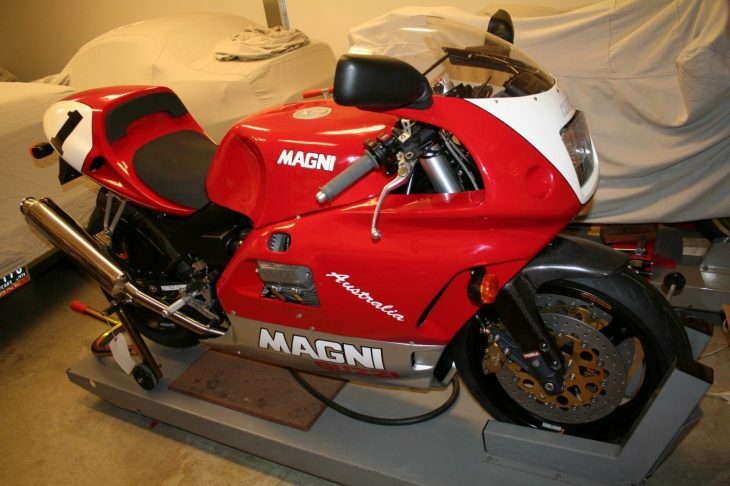 The price is right, the bike is funky, and it makes Italian v-twin noises, although there's more sound than fury. The biggest limiting factor could be the 16" wheels: rear tires are particularly hard to find in the correct sizes, and some of the bigger Guzzis suffered handling issues when fitted with the smaller hoop. They look a little strange too. 18" wheels supposedly fixed the bigger Gooses, so maybe that's an option here, if you don't like the way the Lario goes around corners. 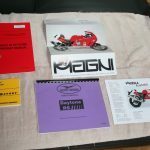 Parts may also be hard to come by, although these days you can probably get used bits from Europe via eBay. 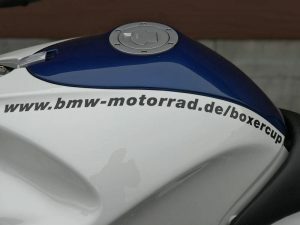 While BMW's wide-ranging catalogue didn't justify a MotoGP campaign, their sport division had a proper bike and its own support race series. 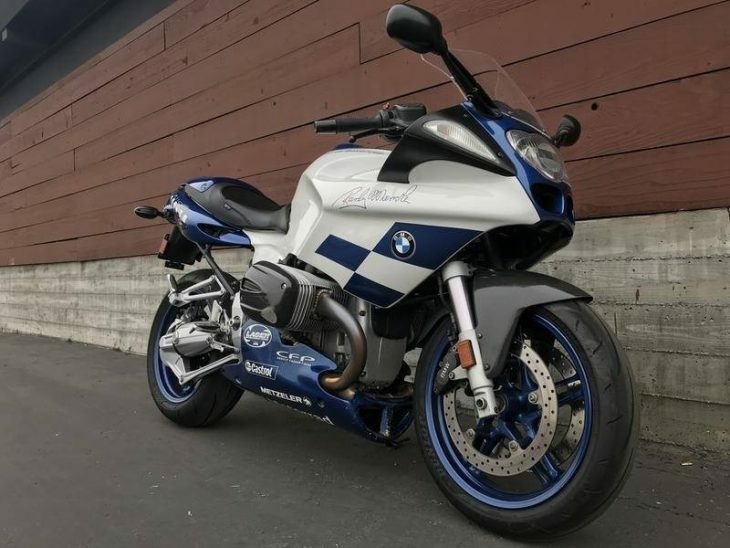 With the brand ambassador Randy Mamola's signature in paint on the fairing, this R1100S BCR has 20K miles and a spotless presentation. BMW put its then most powerful engine in the R1100S as early as 1998, with a single cam for each cylinder actuating four valves, resulting in 98 hp at just 7,500 rpm. 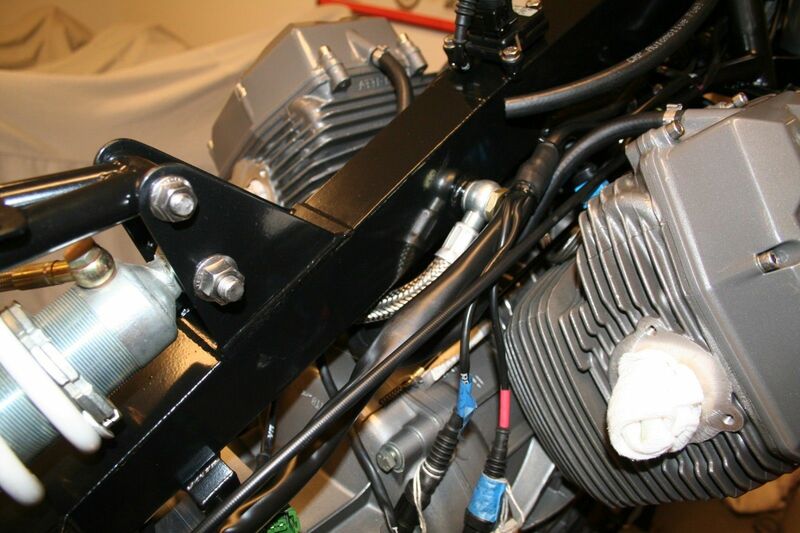 The engine was a stressed chassis member, with front and rear subframes attached top and bottom. 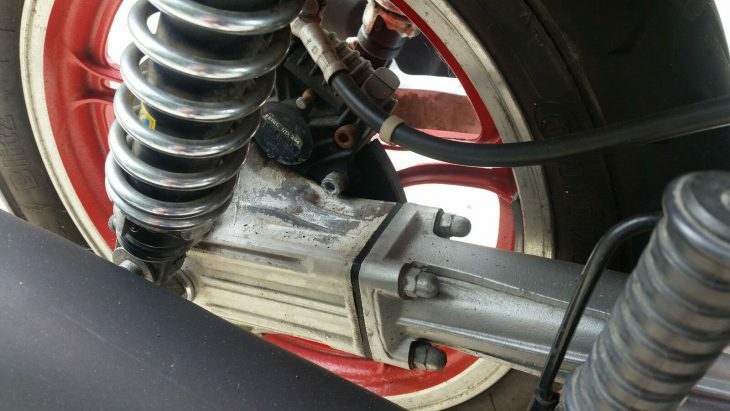 The Telelever front uses a compact monoshock, as does the Paralever shaft-drive rear. The staggered 17 and 18-inch wheels help the heavyweight turn in sharply. 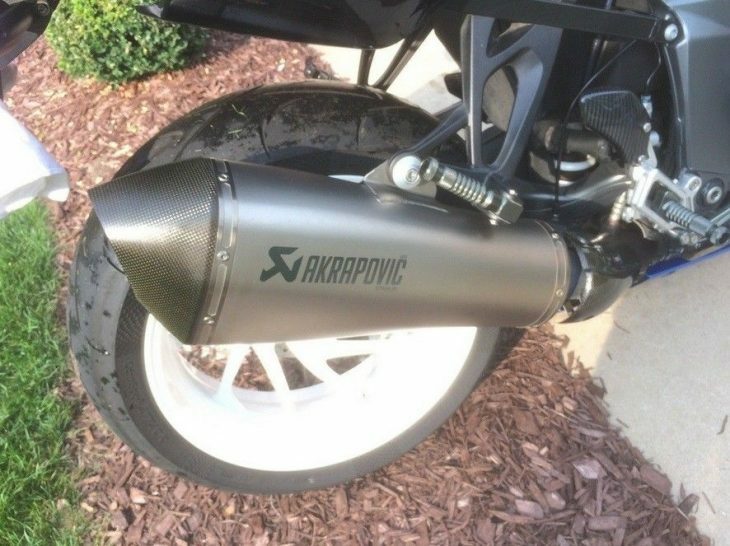 Special parts for the later BCR include dual-spark heads, longer fork tubes for greater lean angles, Laser exhaust, and carbon head covers and mudguards. 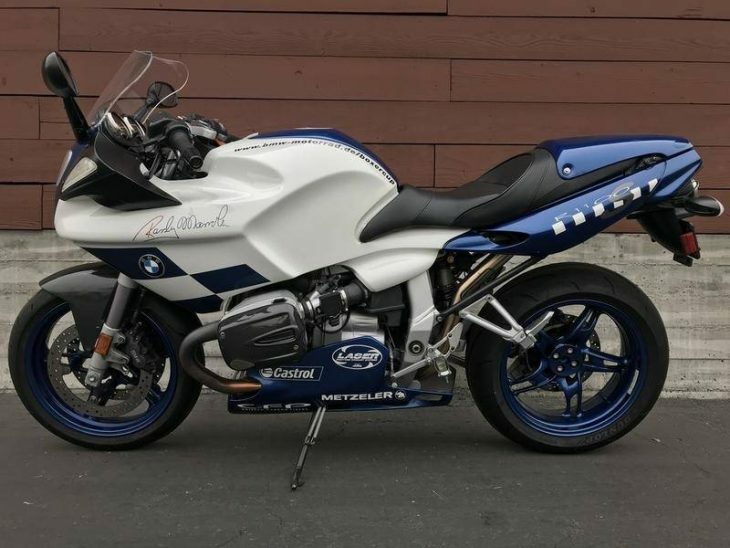 This is a track version of the R1100S, (albeit this track machine is shaft drive and comes with heated grips) and is the mostly unadulterated BCR version of the R1100S and retains everything that makes it a fantastic sport tourer including an upright riding position that allows for the ample leverage needed to wrestle the heavy machine from side to side. 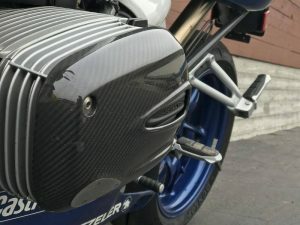 Aside from the blatant difference in livery, rear-solo cowl, and carbon fiber valve covers – complete with sliders – there aren’t many differences between the regular R1100S and BCR-spec models. 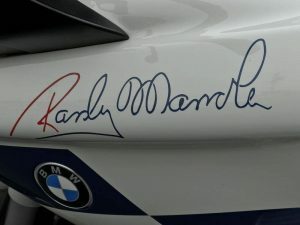 The Boxer Cup Replika (BCR) bikes were equipped with Ohlins suspension, a Laser exhaust, and a special paint livery with Randy Mamola’s signature. 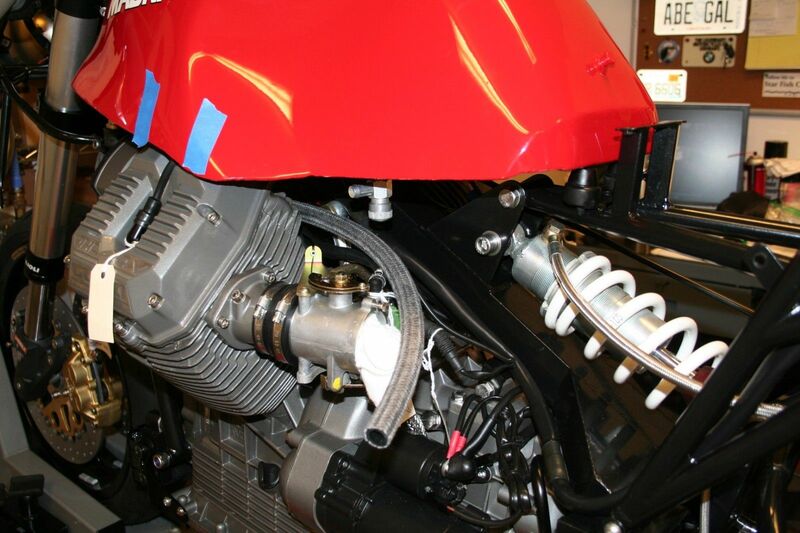 The BCR’s 1085cc twin makes 98hp at 7,500RPM and 71.5 ft-lbs of torque at 5,750RPM. 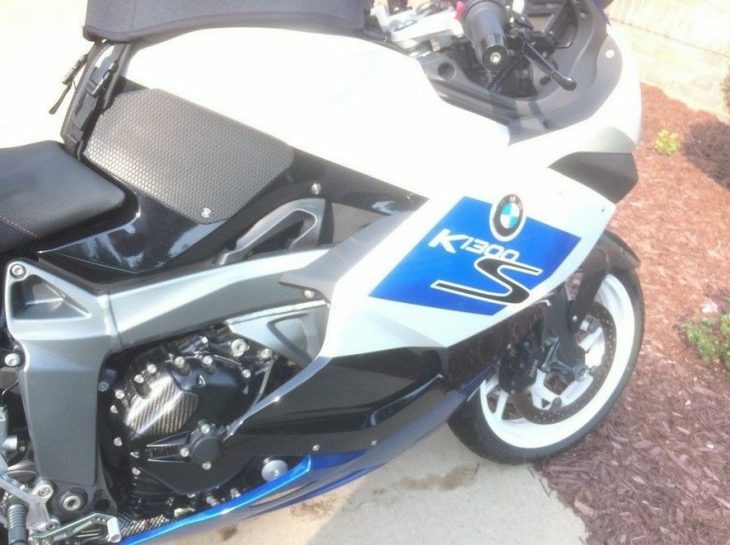 A top speed of 140 mph is nothing too special, granted it does weigh in at just over 500lbs. 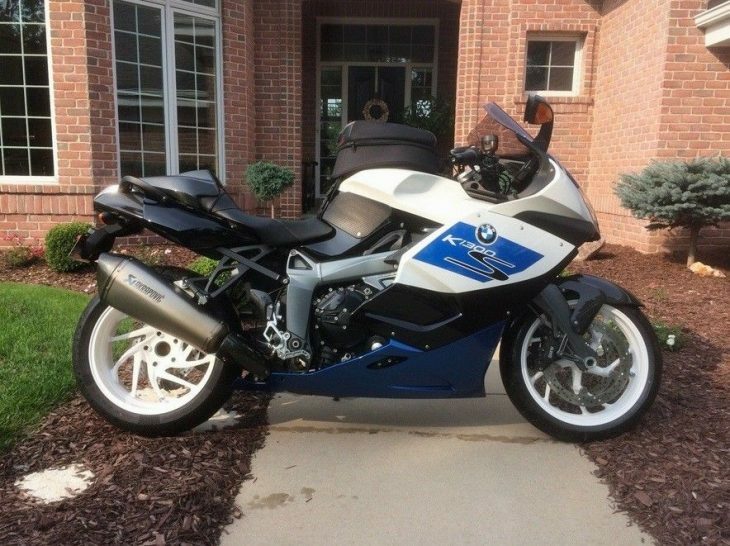 A 31.5-inch seat height allows for surprisingly sporty riding (when you’re not scraping that ridiculously wide engine) and it’s 4.75 gallon fuel capacity is said to be good for a cool 150 miles. 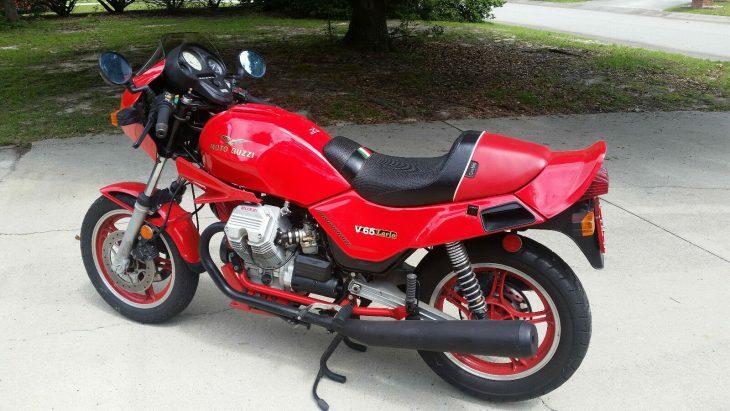 Despite their wanderings toward the edge of insolvency, Guzzi managed to further develop the ngine for the V11, still air cooled and only slightly oversquare for great power and torque numbers of 91 hp and 69 ft.-lbs. 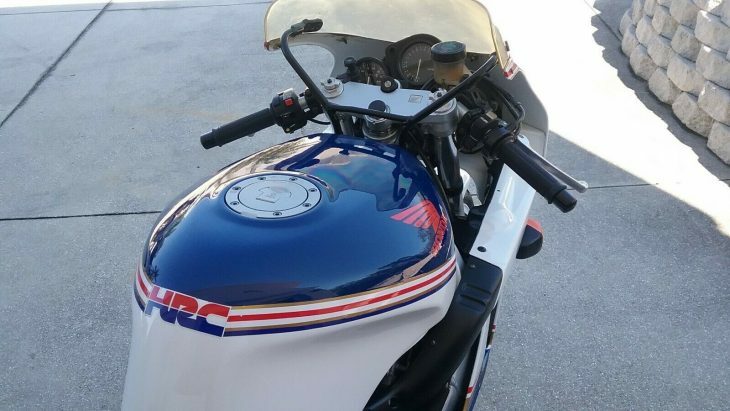 Updated Marelli fuel injection and a smooth 6-speed transmission brought them clearly into the new century, though the overall feel is reverential to past Le Mans. 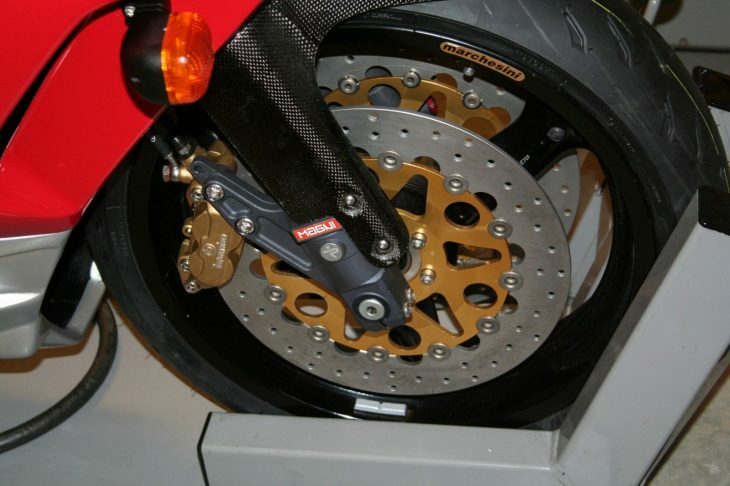 Premium bucks for the time brought premium components from Öhlins and Brembo, along with staples like shaft drive. The sporty aura is completed by clip-on handlebars, some carbon accents, and a monoposto-looking pillion cover on the tailcone. 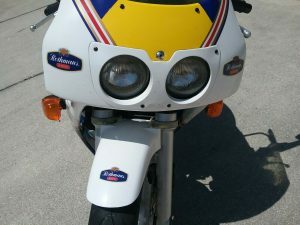 This bike has been repainted to remove the decals that had lifting edges. It has one small scuff on the right hand fairing in the clip on clearance area. 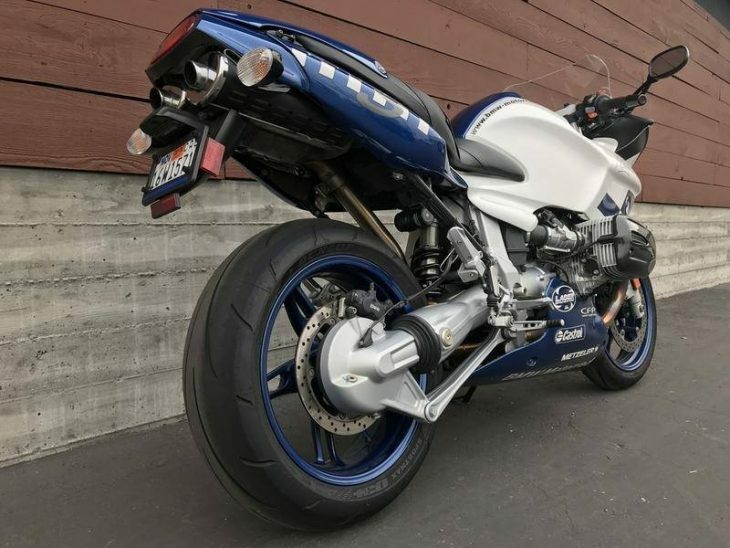 The bike runs very well and needs nothing. 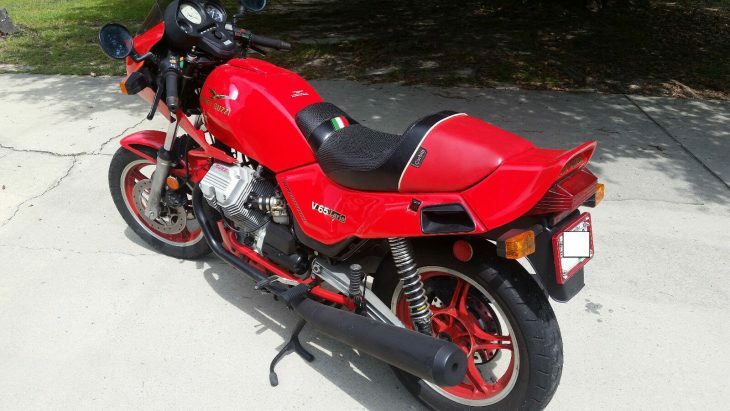 Never meant to challenge the onslaught from the east, Guzzi stuck to their formula and has survived as Italy's oldest marque. 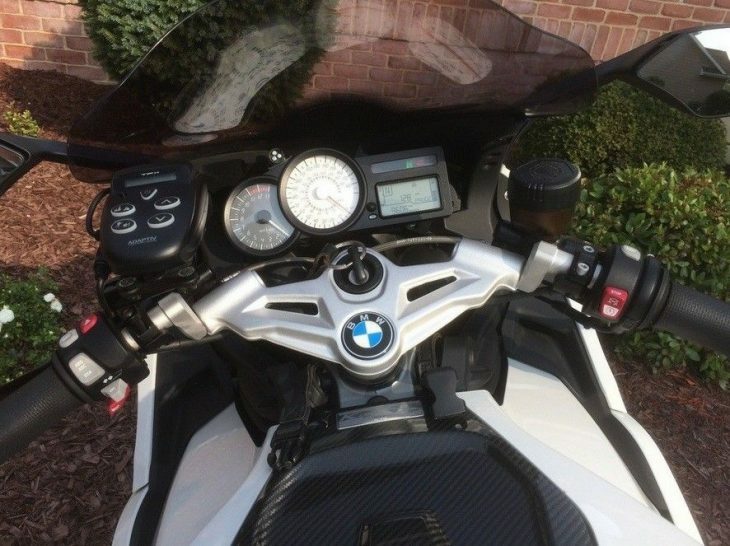 The V11 Le Mans reviewed as a nice all-day rider, fast and stable. Judging from the boutique Jag offerings, this owner knows nicer things and has improved this already very good Le Mans with top-quality updates. If the reserve can be met it should make the new owner quite happy. 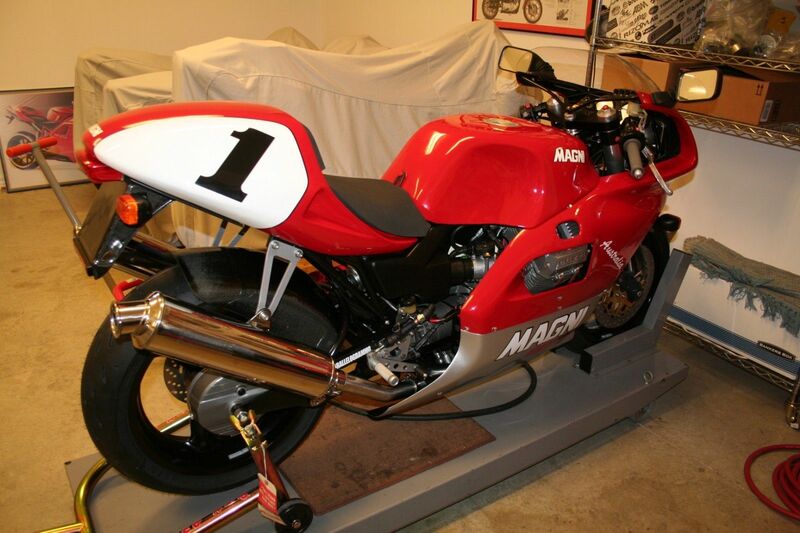 Named in honor of their importer-turned-racer down under, the Australia was Magni's signature homologation special. 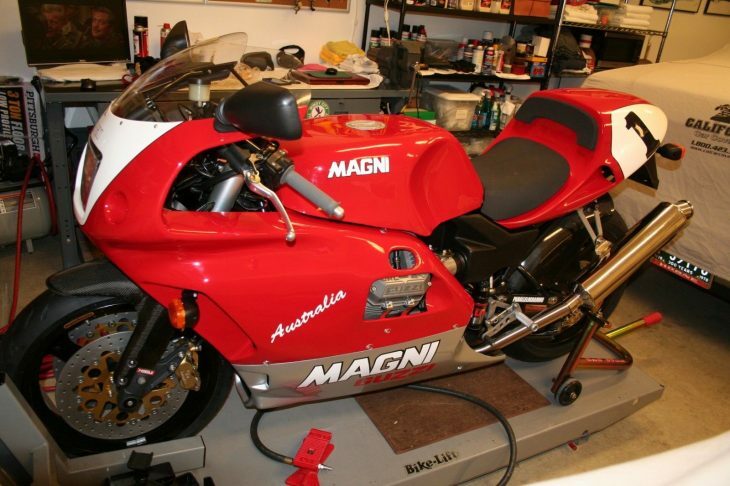 Using Moto Guzzi's quattrovalvole 992cc twin, the Australia is off the sporty and rarity charts. 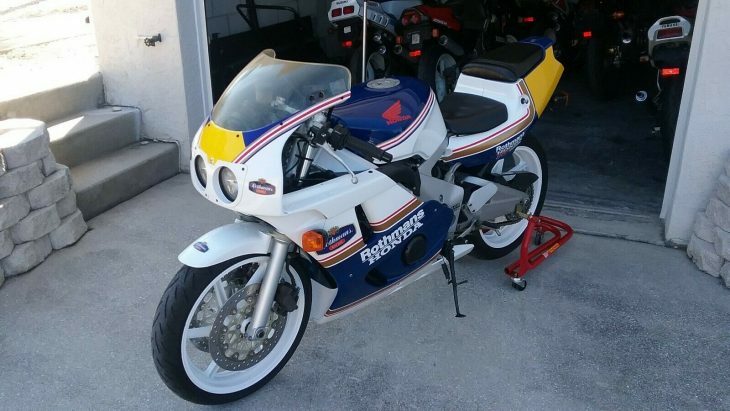 This example is just out of a long restoration and looks like a new machine. 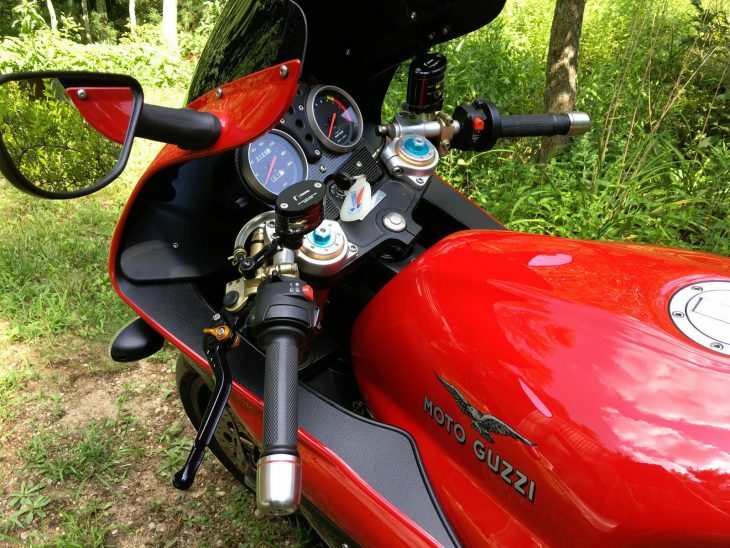 In road trim with Weber-Marelli fuel injection, Guzzi's liter makes 104 well-mannered hp, and a healthy 65 ft.-lbs. torque. 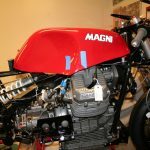 Magni's own downtube frame has oil tankage in the backbone and massive Paioli forks. 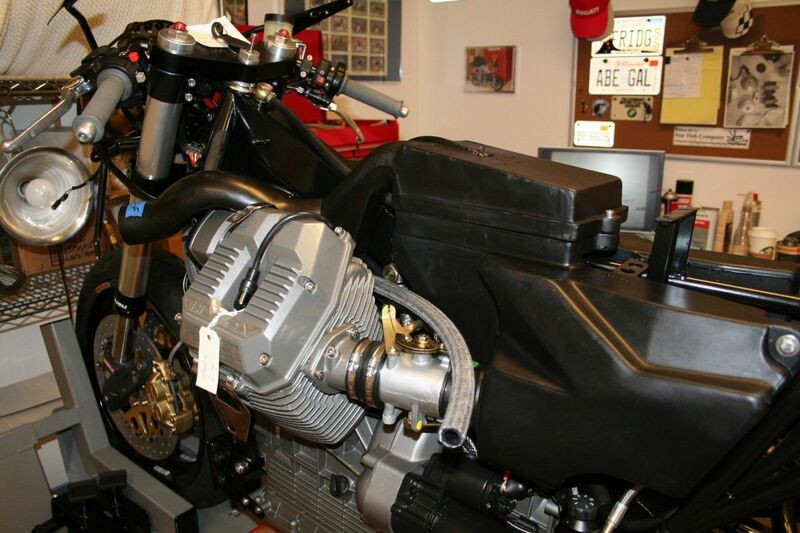 Shaft drive is accomodated by the company's Parallelogrammo monoshock, which reduces extension under power. 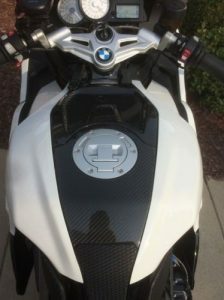 Sporting intentions are confirmed by the thin foam seat and full fairing. Weight is an acceptable 450 lbs. dry helped by carbon fiber mudguards. 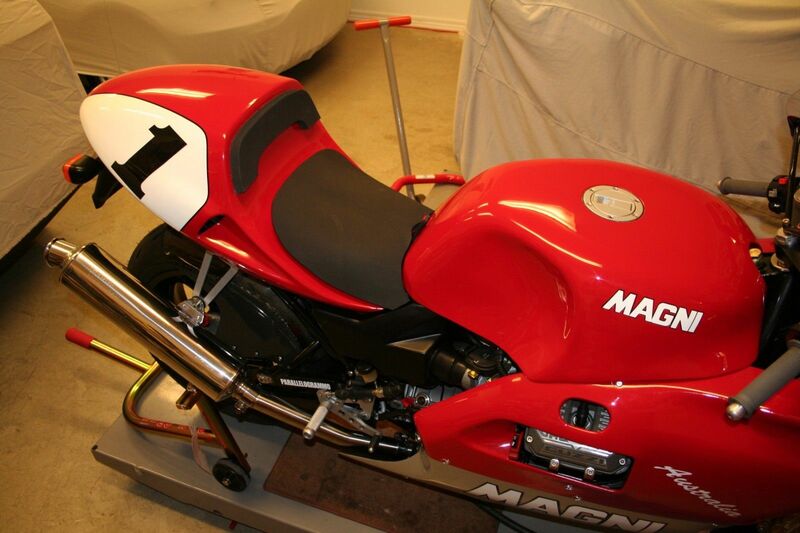 On offer is a 1998 Magni Australia, 1000cc Moto Guzzi Daytona RS powerplant in Magni Parallelogrammo frame. 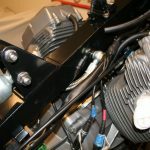 I have recently completed a four year recommission/rebuild of the machine with many new parts including recent tires and battery, coils, all cables (fast idle, throttle, clutch, speedometer), NOS injectors and bodies, new Bosch fuel pump, injectors, and rubber boots, throttle potentiometer, main fuel valve, vacuum tank sender, all oil and breather lines, fuel lines, temperature sensors, cam position sensor. New rear brake carrier and rotor, new brake pads and HEL stainless lines, calipers rebuilt with Brembo kits, new buttons in front discs. 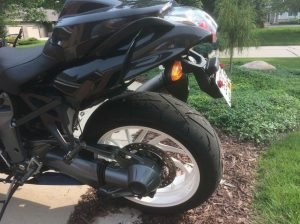 All fluids fresh, bike has run on bench test, tank is flushed and dry, brakes have not been filled and bled since rebuild. 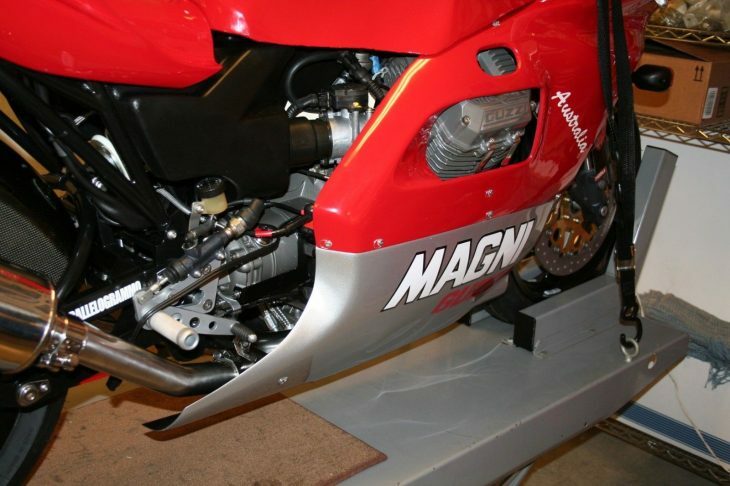 All stainless steel pipes, muffler and crossover, fairing brackets are freshly polished, all fasteners have been replaced with European made stainless fasteners, unpolished. Recommissioning used all Wurth supplies, torque specifications to manufacturer standards. All paint on bodywork and frame is original, lower belly pan professionally repainted due to stone chips, there have been no modifications to the machine that I can verify since it was constructed. 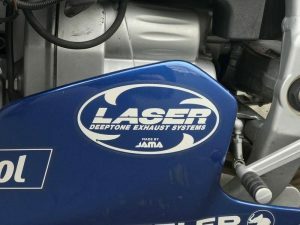 VIN number is shown, engine number is KL011565. All takeoff parts and fasteners will be furnished with the machine if the purchaser desires. 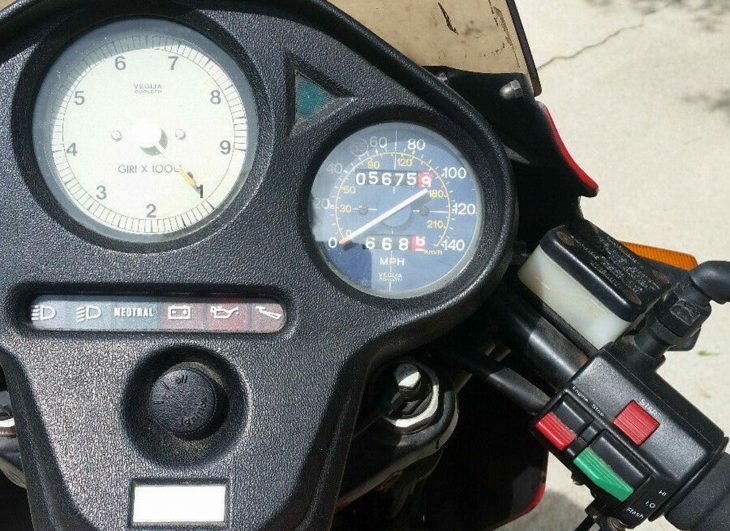 Odometer has been replaced with white faced metric instrument showing 1 kilometer. Original shows 10,183 miles, appears to be original. 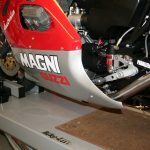 Arturo Magni prepared Count Agusta's racing motorcycles ( for the likes of Surtees, Hailwood, and Agostini ) until the company quit racing in the mid-seventies, then he and his sons formed their own company. 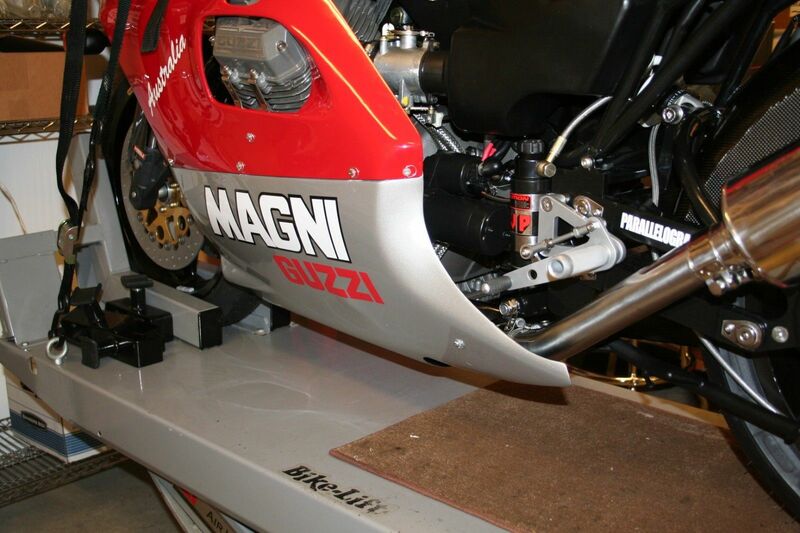 Magni sampled different powerplants until 1985 when a lasting relationship with Moto Guzzi was formed. 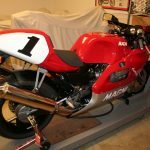 The Australia reviewed as having a foot in two worlds - sharp handling but stable with the V-twin's low CG, the maintenance-free shaft drive hardly noticeable with the parallelogram swingarm, the Daytona RS engine powerful and torquey. 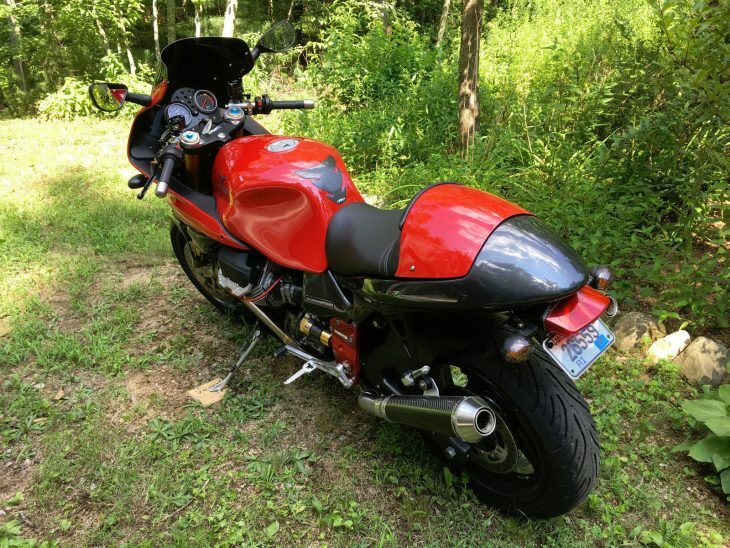 A "new" '98 by many measures, it should give the new owner many hours of enjoyment, even if the gas, oil, and brake fluid never go in. Bidding is active but hasn't met the reserve yet. Questions can be sent to Warren via the eBay auction.